The district of Koch Bihar is situated to the east of Jalpaiguri The Kochbihar Palace, remarkable for its wonderful architecture and royal grandeur, undertaken and being developed by the Archeological Survey of India as a museum, attracts a large number of tourists. The Madanmohan temple and the beautifully planned Sagardighi area are also worth visiting. The other famous heritage sites in the Dooars region are Gosainmari and Jalpeshwar temples and the remains of the Buxa Fort. Air: Koch Bihar airport operates flights to Delhi and Kolkata (812 km). Rail: The nearest main railway station is New Jalpaiguri. The district is well connected by rail with other parts of the State. The best way to visit these heritage sites is to reach Siliguri and travel by rail or a hired vehicle. Road: The district is well connected by road with other parts of the State. The best way to visit these heritage sites is to reach Siliguri and travel by road or a hired vehicle. Madan Mohan Temple: This golden-domed temple is one of the main attractions in Koch Bihar town. 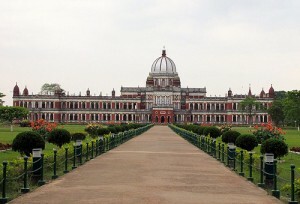 Royal Palace: This Victorian Palace on Sagardighi covers a total area of 4766 sq. metres. Baneshwari: Baneshwari is about 10 km away. The famous Shiva temple here dates back to 1100 B.C. Gosanimari: Gosanimari is just 37 km away. A fine example of 17th century Bengal temple architecture, the Kamteswari temple is the main attraction here. 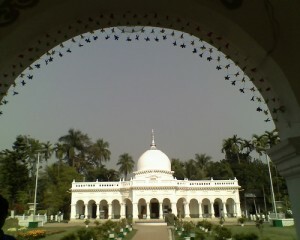 This entry was posted in Kochbihar, West Bengal. Bookmark the permalink.